Above: Sheep's-bit on the coast alongside Thrift Armeria maritima and Kidney Vetch Anthyllis vulneraria. Some people refer to this wildflower as Sheep's-bit Scabious, but it is not closely related to true scabious species such as Devil's-bit Scabious Succisa pratensis, which belong to the Honeysuckle family Caprifoliaceae. 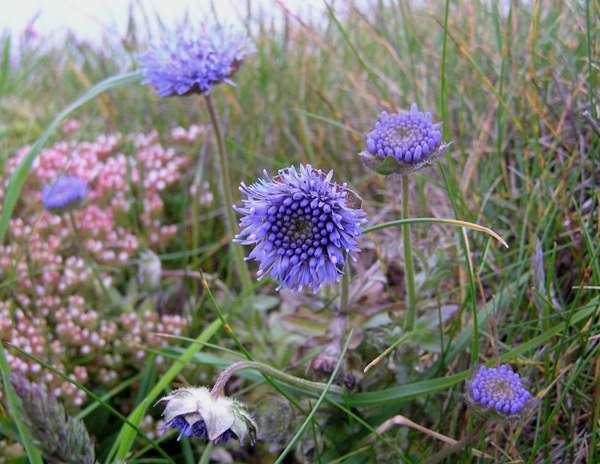 This low-growing biennial has a basal rosette of narrow, pointed leaves from which arise slender stems bearing blue scabious-like compound inflorescences each comprising 50 to 200 tiny tubular campanulate flowers. 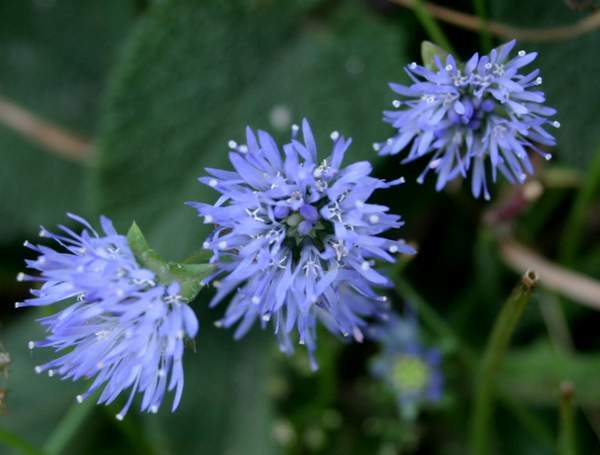 Sheep's-bit is common in Britain and Ireland; it also occurs on mainland Europe, becoming increasingly scarce towards the northern part of Scandinavia and similarly the southern extent is limited to south-central Europe. The range extends eastwards into western Asia; elsewhere, including North America, it is an introduction. This low-growing member of the Bellflower family prefers dry places. It is particularly common on clifftops and heaths, where it copes well with strong winds. 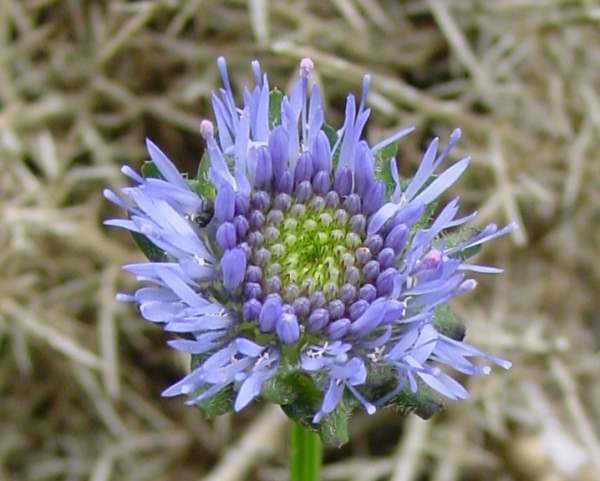 Sheep's-bit favours acid soils and is so absent from calcareous substrates. The first flowers appear in May and blooming continues into September. Sheep's-bit is usually at its best from late June until early August. Sheep's-bit is sometimes confused with Devil's-bit Scabious Succisa pratensis, a somewhat coarser but otherwise similar wildflower. The leaves of Sheep's-bit are long and narrow, while those of Devil's-bit Scabious are more oval. Although so similar in appearance these two wildflowers come from different families: Devil's-bit Scabious belongs to the Teasel family - Dipsacaceae. The specimens shown on this page were photographed on the Pembrokeshire Coast Path in spring.